One of northern Vermont's cultural and architectural gems, the St Johnsbury Athenaeum is a splendid 19th-century building with an outstanding art collection. The St Johnsbury Athenaeum, in the center of the city at 1171 Main Street (map), is a combination library and art gallery founded in 1871 as a gift from Governor Horace Fairbanks of the famous St Johnsbury industrial and commercial family. 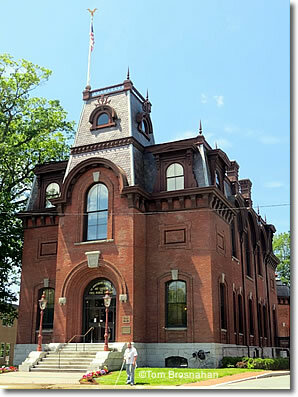 Apart from its role as the intellectual and archival center of St Johnsbury, the Athenaeum building is a beautifully-preserved treasure of New England Victorian architecture. Within the proud red-brick, mansard-roofed structure, its finely carved and finished wood floors, stairways, bookshelves and other furnishings are a pleasure to see. A substantial portion of the Athenaeum's interior space is dedicated to a gem of an art gallery boasting more than 100 works of art from the late 1700s to mid-1800s, gifts of the Fairbanks family, including original paintings by Hudson River School and Western artists Jasper Cropsey, Asher B. Durand, Sanford Gifford, James and William Hart, Samuel Colman and Worthington Whittredge. There are also copies of works by Bonheur, Del Sarto, Dolci, Fra Angelico, Murillo, Raphael, Rembrandt, Van Dyck and Veronese. Pride of place goes to the huge (10 by 15-foot/3 by 4.5-meter), dramatic painting by Albert Bierstadt: "The Domes of the Yosemite." This painting alone is reason enought for a visit to the Athenaeum. 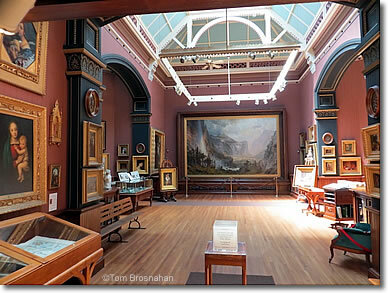 The art gallery at the St Johnsbury Athenaeum, with Albert Bierstadt's "The Domes of the Yosemite" on the far wall. The Athenaeum is open to the public, and offers free Wifi.